A Ferrari crashed into an apartment building at Franklin and Van Ness avenues in Hollywood Thursday, March 26, 2015. 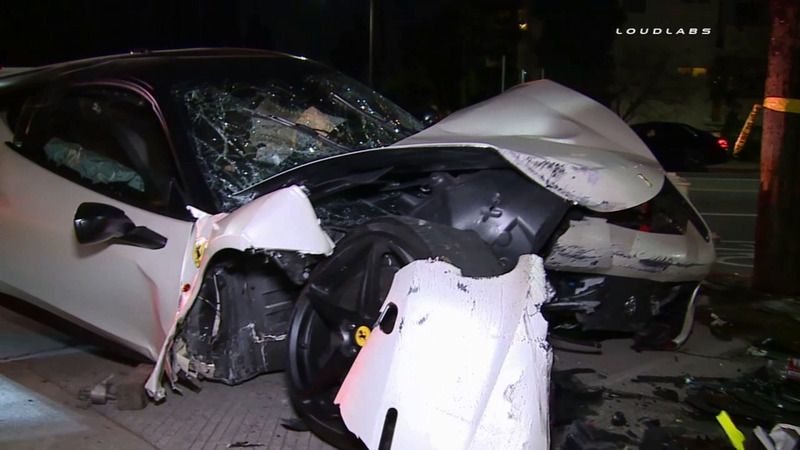 LOS ANGELES -- A Ferrari involved in a street race in Hollywood crashed into an apartment building Thursday night. Authorities say the accident involving a Ferrari 458 Italia -- worth approximately $289,000 -- happened at Franklin and Van Ness avenues at 10:36 p.m. The luxury car slammed into the side of the apartment building. The driver of the Ferrari had only minor injuries, but the car sustained major damage. According to the LAPD, A Ferrari and Porsche were racing, and they approached a slower vehicle, the two cars split lanes. The driver of the Ferrari lost control and crashed. It's unclear how fast the two cars were going, but witnesses told police the vehicles were traveling at a very high rate of speed. The driver of the Porsche stopped after the accident, police say, and the two drivers were seen arguing. The driver of the Porsche then left the scene, so police are handling the incident as a hit-and-run.